TELEXISTENCE Inc. appeared in Forbes. Such media that a human user has his or her avatar body in an environment that the media mediates such as a computer generated information environment or a remote real environment and he or she is able to act using the avatar body as his or her own body in the environment. 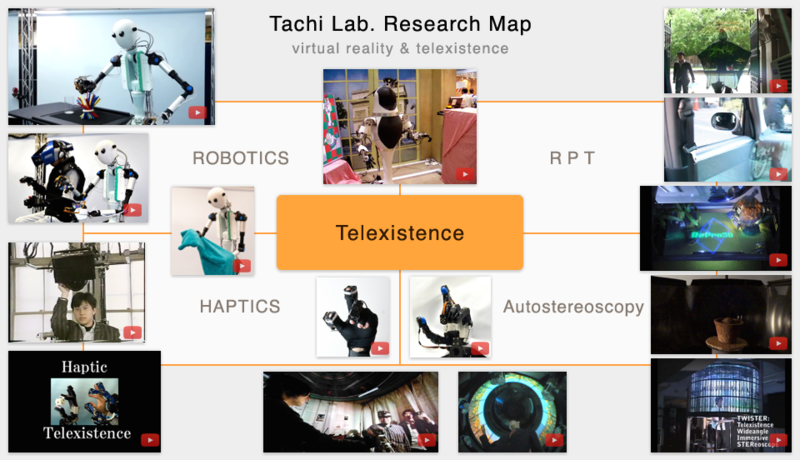 Virtual Reality and Telexistence are the typical examples of Embodied Media. Tachi Lab. was founded by Prof. Susumu Tachi in 1989 at the Research Center for Advanced Science and Technology (RCAST) of The University of Tokyo. 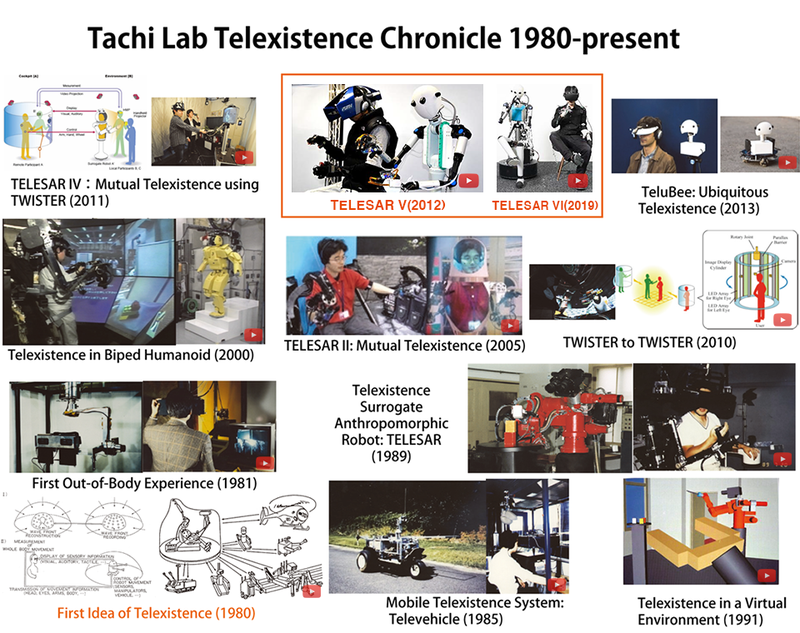 From 1994 till 2009, Tachi Lab. was in the Department of Information Physics and Computing, Graduate School of Information Science and Technology at The University of Tokyo. From 2009 till 2015, it was in the Graduate School of Media Design of Keio University (KMD). In April 2015, it relocated to the Institute of Gerontology, The University of Tokyo. We live in an era where the speed of technological advances has far exceeded the rate of individual’s adaptation and learning abilities. To avoid a fatal outcome, researchers and developers of computer technology must cultivate a human-centered paradigm. It is essential to establish a technology where people can interact naturally with machines like robots and computers, as if they are interacting naturally with other people or nature, in a cybernetic way that is truly human-oriented, thoroughly backed up by knowledge of physiology and cognitive behavioral psychology. We can permit various forms of interface, but the default interface has to be object-oriented, with a clear standard by which people can interact with machines as if they are handling natural objects. Click each picture to play the video. Telexistence (tel-existence) runs concurrent with this human-centered notion. It is a fundamental concept which refers to the general technology that enables a human being to have a real-time sensation of being at a place other than where he or she actually exists, while being able to interact with the remote environment, which may be real, virtual, or a combination of both. It also refers to an advanced type of teleoperation system which enables an operator at the control to perform remote tasks dexterously with the feeling of existing in a surrogate robot working in a remote environment. A surrogate robot and a remote environment can be virtual. Real operation through virtual space is also possible, i.e. Augmented Telexistence. Telexistence ultimately enables humans to be virtually ubiquitous, i.e., being or seeming to be everywhere at the same time. -Telexistence- telexistence communication, mutual telexistence, and haptic telexistence using Telexistence Surrogate Anthropomorphic Robot (TELESAR). -Telexistence wide-angle immersive stereoscope (TWISTER), which has full-color autostereoscopic display with 360-degree field of view. -RPT (Retro-reflective Projection Technology), which includes Optical Camouflage and Transparent Cockpit. -Autosteroscopic and Haptic Virtual Reality, which includes Repro3D, a full-parallax autostereoscopic 3D display with haptic feedback using RPT, and HaptoMIRAGE, a multi-usered wide-angle aerial autostereoscopic display in augmented reality environments. -Haptics based on Haptic Primary Color Principle, including electro-tactile display with receptor selective stimulation, TECHTILEtoolkit, haptic camera (GelForce), tangible 3D dispaly (GravityGrabber, GhostGlove, Pen de Touch) and Haptic Editor.